Don’t you just love a winter wedding? There are so many ways to decorate and nature is so helpful when you are planning your wedding during the winter months. I have prepared 20 amazing DIY winter wedding decorations that will help you to capture the beauty of winter, and they’re all really cheap to make. If you are planning your wedding on a budget, these decor ideas will really come in handy Not only are they cheap, they’re really easy. If you want to add some homemade decor to your wedding, and you want to do it without spending a fortune, these winter wedding decor ideas are perfect. I’ve planned a few weddings in my time and even a few during the colder months. I love outdoor weddings and while this may not be feasible during winter…depending on where you live…these winter wedding decorations will allow you to bring some of that beautiful winter nature indoors for your special day. And you just have to check out these 25 DIY wedding photo displays that will allow you to showcase your favorite pictures of family and friends during the wedding or reception. Just imagine standing in front of a beautiful cloud backdrop or perhaps covering your reception tables with snow covered pinecones to really bring in the beauty of winter. 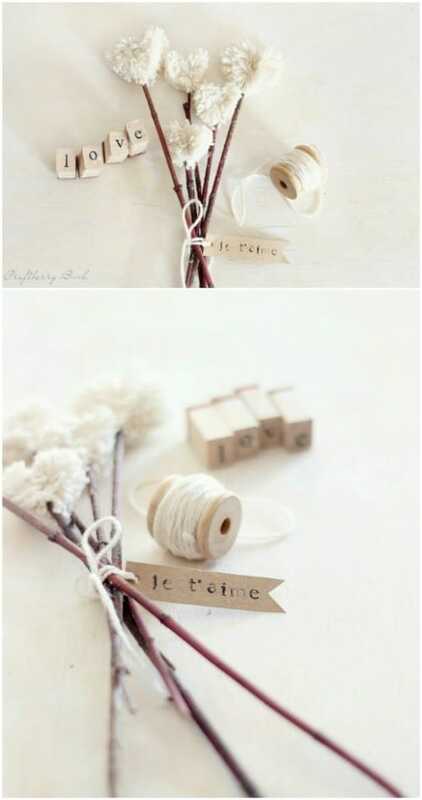 If you are planning a winter wedding, I think you will find these DIY decorations to be perfect. From rustic décor to elegant decorations, they are sure to fit your wedding no matter how you are decorating or where you are having it. 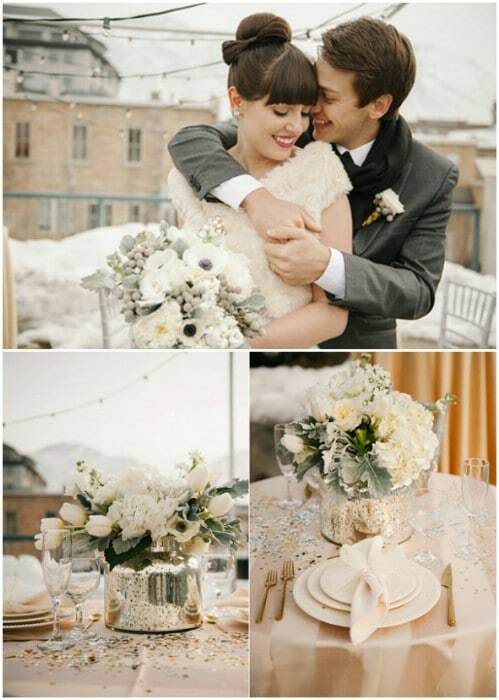 I hope these decor ideas will help you to plan the perfect winter wedding. And, be sure to take a look at these 35 DIY rustic wedding decorations that are perfect for country decorated weddings. These glittery gold candles are perfect for intimate or elegant weddings and they are super easy to make. If you really want the winter look, you could also do these in white or silver. 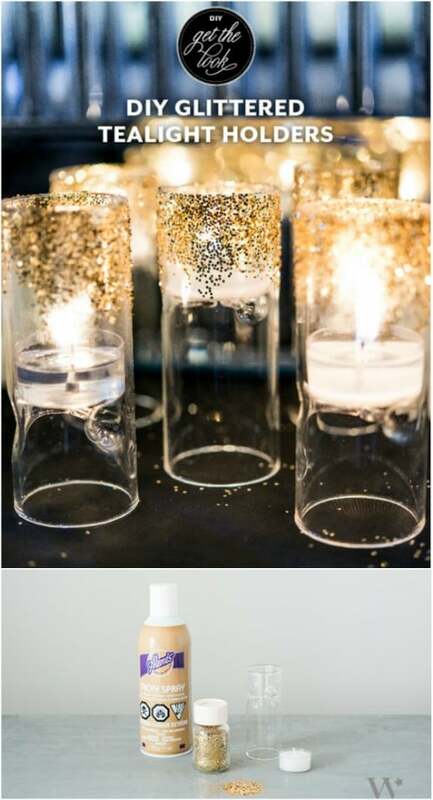 To make them, you just grab some clear glass candle holders and use spray on adhesive to coat them before adding gold glitter. These make up really fast and they are perfect for decorating your reception tables. I love these little gift boxes for handing out wedding favors or you could also use them to decorate your reception tables. 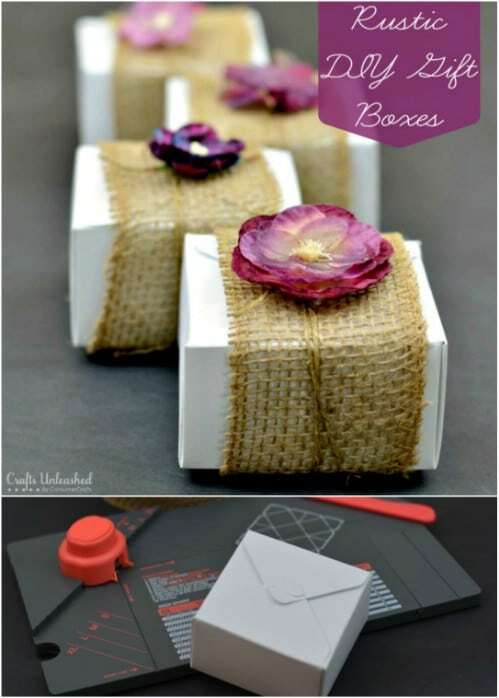 They are super easy to make and you only need box board, burlap ribbon and some twine to make them. They also have gorgeous floral accents which you can leave off if you want. Use winter flowers to decorate them or even a sprig of evergreen to give them a great winter wedding look. 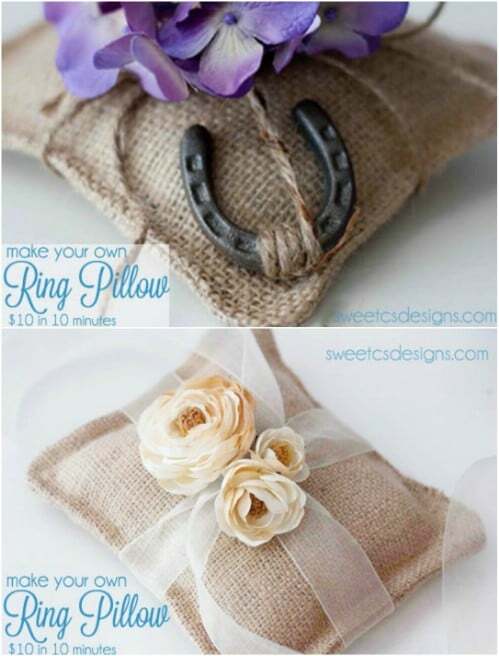 If you want something to go along with a rustic wedding, this little burlap ring pillow is perfect. You’ll need two squares of burlap along with fiberfill or pillow stuffing, twine and some winter flowers – the Dollar Store has these really cheap. If you’re planning your wedding around the holidays, use a bit of poinsettia or add some evergreen twigs to give it that great Christmas look. DIY burlap projects are so cheap and easy and really do create amazing décor. 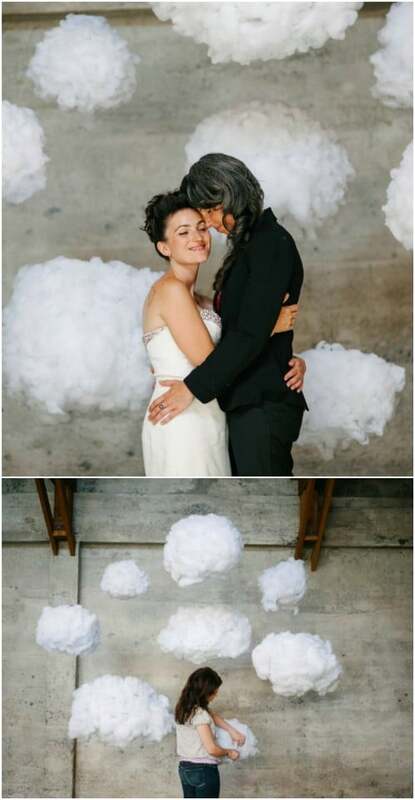 These clouds are gorgeous and perfect for putting behind you while you say your vows or you could use this as a photo backdrop. The clouds are really easy to make and they’re so fluffy. You could even add little glitter covered snowflakes coming down from them if you really want to add some winter charm. These are made from polyester stuffing and paper lanterns and are gorgeous when they are finished. Apples make the most wonderful candleholders. They are inexpensive and really gorgeous. 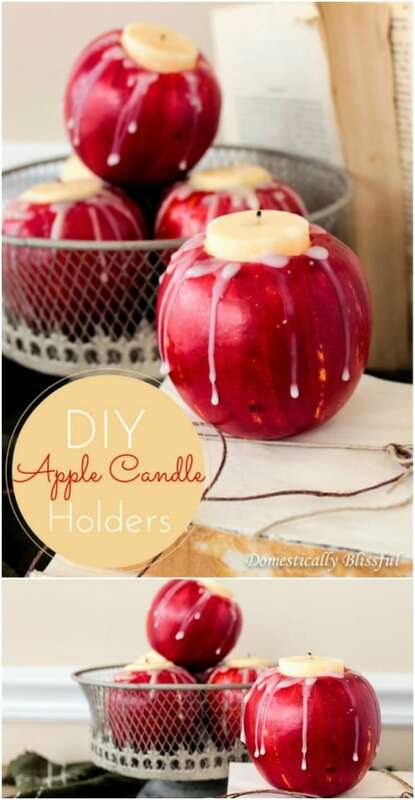 You can make your own winter apple candleholders from real apples…although those may turn brown during the ceremony. A better way is to use artificial apples which you can pick up at any craft store. Just hollow them out enough to place a tealight candle and maybe add some winter embellishment with melted wax, glitter or even fake snow. 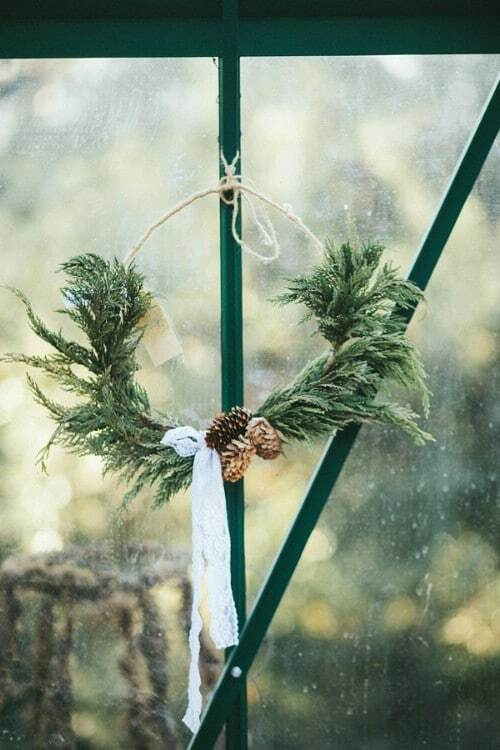 Take some evergreen sprigs and tie them around with twine and you have the most gorgeous hanger for your wedding decorations. This is such an easy project and if you have a roll of twine and an evergreen tree or two, this one won’t cost you anything. You can embellish these with spray painted pinecones in gold or silver and hang them all over your venue to give off a wonderful winter vibe. You can really add some winter wonder to your wedding with these cheap and easy to make snow covered pinecones. I paint pinecones every year to decorate for the holidays and they really are easy to do. 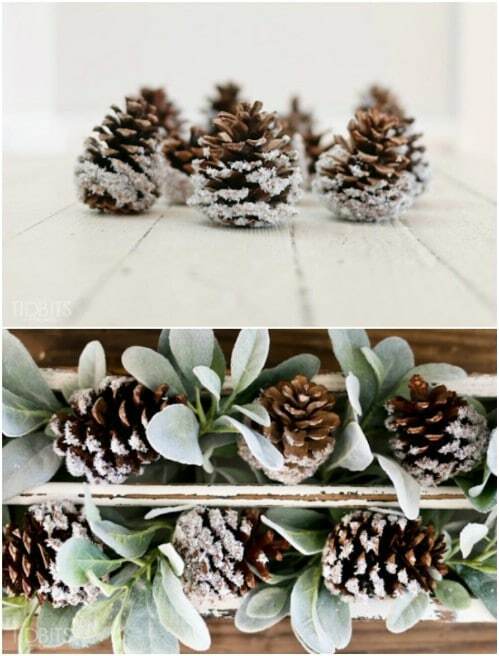 All you need to do is gather up some pinecones from the yard and then use spray fake snow to cover them. Or you can use glue or mod podge and fake snowflakes. 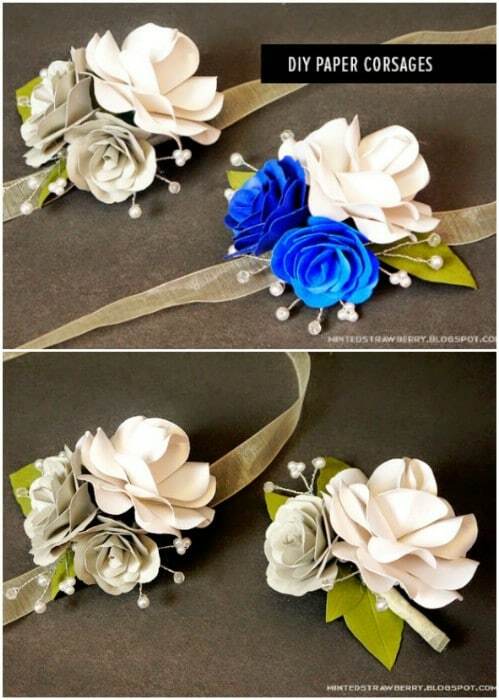 These are great for decorating the wedding and reception and you can even add a few to your bridal bouquet. DIY pinecone projects make the most wonderful decorations. 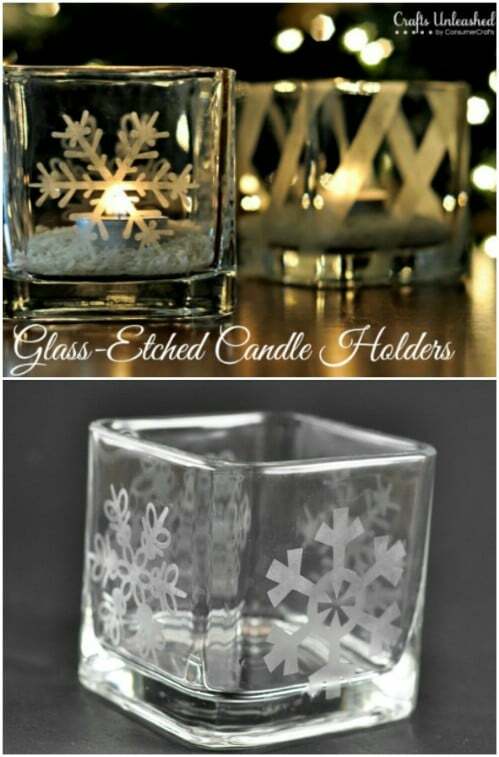 These glass etched votive candleholders are simply gorgeous, and they’re perfect for your wedding when you add snowflakes as the etching. You need a glass votive holder, which you can get at the Dollar Store for a couple dollars each. Then decide on the design that you want and use transfer paper and etching to make it. The votive holders are then filled with tea lights and you can use them to decorate your tables or to light your way up the aisle. These painted bottles make the most inexpensive candleholders and they are gorgeous when they’re completed. You make these by simply spray painting glass bottles in the color of your choice. For winter weddings, I suggest gold or silver paint and maybe some fake snow at the bottoms. While your bottle is still wet, just sprinkle on some fake snow and you have the perfect winter wedding candleholder. Then add a taper candle and use these wherever you want some added décor. For displaying pictures of you and your betrothed throughout your relationship, or for adding pictures of family and friends, these little DIY gold nugget photo holders are perfect. They are really easy to make and each one costs very little with regards to supplies. Now, if you want to winter them up, I suggest adding in some fake snow or put them in a centerpiece with evergreen and pinecones. This garland that is made from faux feathers and string lights is perfect for decorating your winter wedding venue. You paint half of the feathers with glitter, which gives them a snowy appearance and then use them to cover paper lanterns which are lit up by your string lights. These really are easy to make and they won’t cost much. 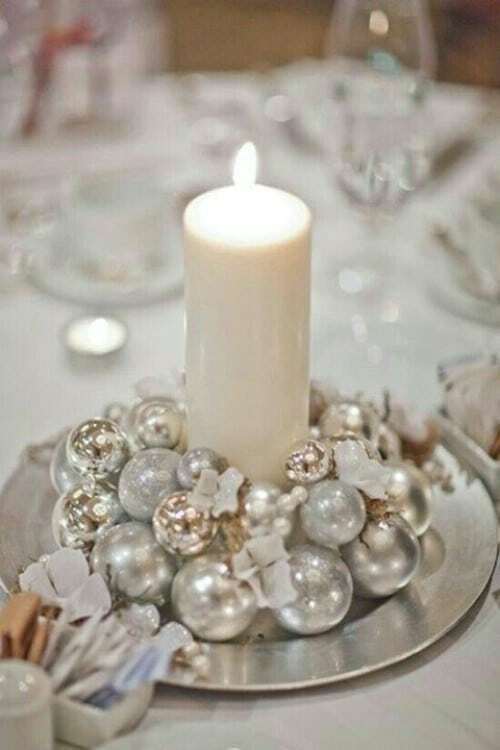 They are gorgeous when they’re finished and perfect for adding a winter touch to your wedding decor. Little white hearts really give this bouquet a winter look. I love how easy this one is to make and you can use it to decorate your reception tables or even have your bridesmaids carry them. 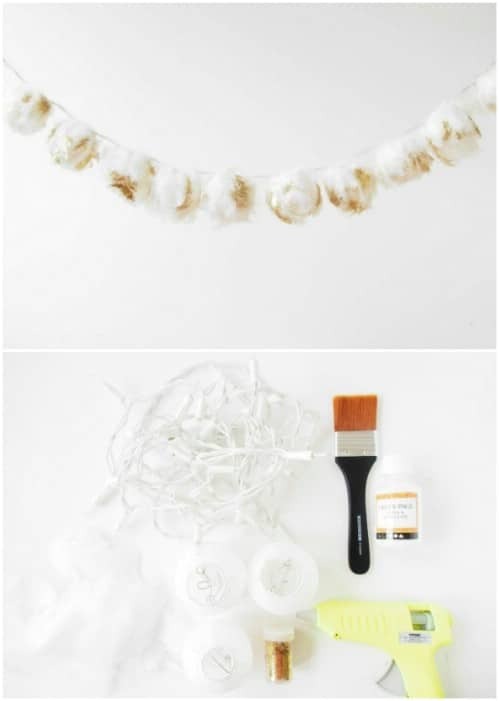 You just make the pom poms with white yarn and then when you have enough, just attach them to twigs and tie them all up with twine. You could even add in sprigs of evergreen to make this even wintrier. Okay, so fireflies are more for summer, but you can still use the concept to create these stunning lights. Just add a string of miniature LED lights the inside of a mason jar using adhesive mounting dots. Don’t you just love good mason jar decorating projects? And, to make this one more wintry, you can add some spray on fake snow or silver glitter to the bottom of the jar. 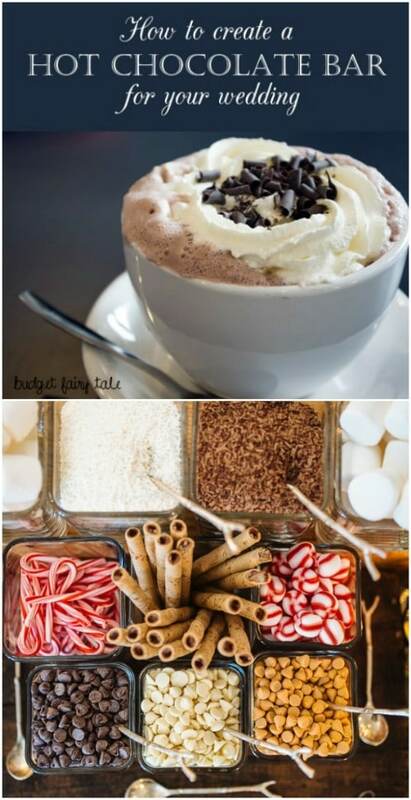 his is perfect for winter weddings and you can make your own hot chocolate mix so it’s not terribly expensive. The hot chocolate will help to ward off the cold and really, nothing says winter like a steaming mug of hot cocoa so this really is perfect for your winter wedding. I love this DIY headpiece, not just because it’s inspired by Givenchy but because it is perfect for adding a bit of winter wonder to your wedding day. This one is pretty simple to make and is perfect for casual winter weddings. You need a metal headband with sew on studs, pearl strands and a few gemstones to make it. It really looks like something right out of the 1920s and is so gorgeous when it’s complete. 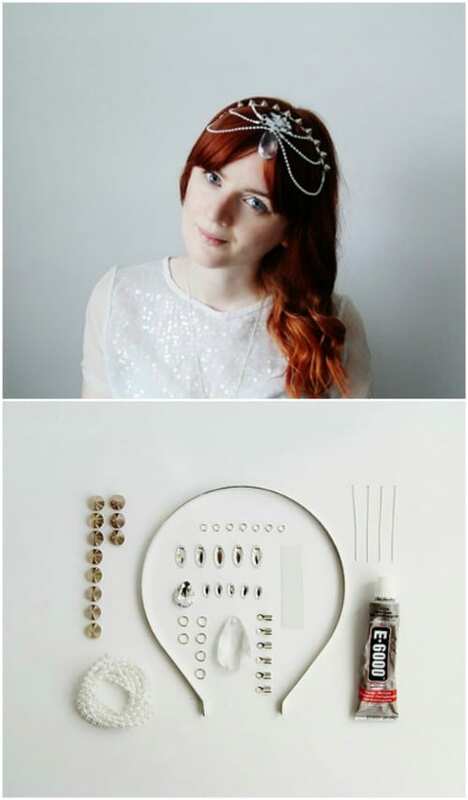 You can also use this concept to create beautiful decorations for your tables. Just lay the headbands on the table and stick a candleholder in the center. These mercury centerpieces are much easier to make than you may think and they won’t cost you a fortune. To make these, you need glass candleholders and some shiny silver or mercury colored spray paint. That’s it – Just spray paint the candleholders to give them a gorgeous shine and then add flowers or candles. Make this even more perfect for winter by dipping the bottoms in fake snow while the spray paint is still wet. Make your own corsages for mothers or use these floral pieces to decorate your tables with winter flowers. Choose a color that of course coordinates with your wedding colors and then add in whites to give it a nice wintry look. You can also add evergreen sprigs instead of leaves to make these even more perfect for winter. The flowers are made from paper and super cheap and easy to do. 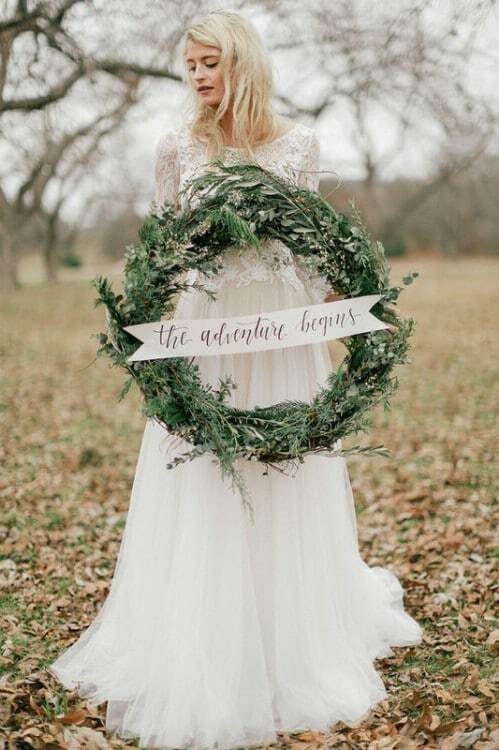 This winter wedding wreath is a must if you are getting married during the colder season. It’s made from twigs of evergreen and other winter foliage and has a nice snow covered effect which you can get with a can of fake snow. You could even add in a few snow covered pinecones or any other winter decorations that you want. Hang this behind you while you’re saying your vows or over the bride and groom table at the reception. You can also use your DIY Christmas wreath if your wedding is really close to the holidays. 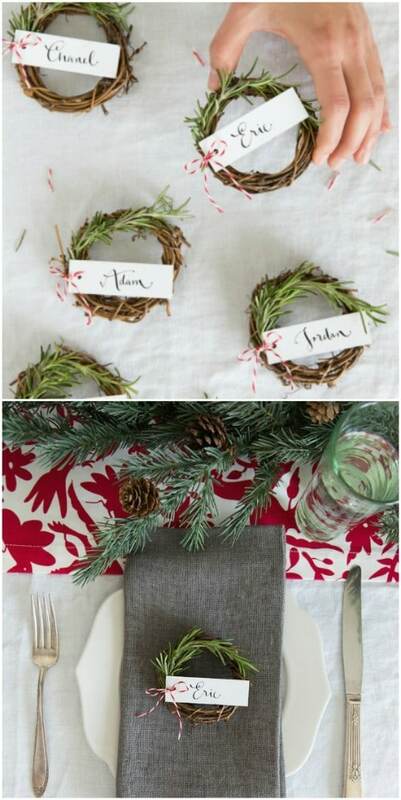 Turn your reception tables into a winter wonderland using these DIY rosemary sprig place cards. If you are using place cards, these are super easy and really cheap to make. You’ll need rosemary and the amount depends on the number of place cards that you need to make. Just twirl your rosemary around into a wreath shape and tie it together with string or twine. Then add your names with small tags. This winter wedding centerpiece is super easy to make and you can use things that you probably have on hand already. This is made by placing a pillar candle on a silver plate and then surrounding it with Christmas tree ornaments. The Dollar Store has loads of these plates for really cheap and you can pick up cheap ornaments as well. These are really gorgeous on their own but you can also embellish them by adding sprigs of evergreen, pinecones or red ribbon to give them a great holiday wedding look.